Blog > Mortgage application information | A Mortgage Now > Mortgages – how much can I borrow? Mortgages – how much can I borrow? How much can I borrow from a mortgage lender? Perhaps the most common question asked by potential mortgage borrowers, and yet in many ways the trickiest one to answer. Pick the wrong mortgage lender and you may be offered maximum mortgage lending over 20% lower than a total figure available to you. Pick an unsuitable mortgage lender if you have student loans, childcare costs, or pension contributions, and you could be severely disadvantaged. On this page we attempt to provide some guidance and clarify some myths. 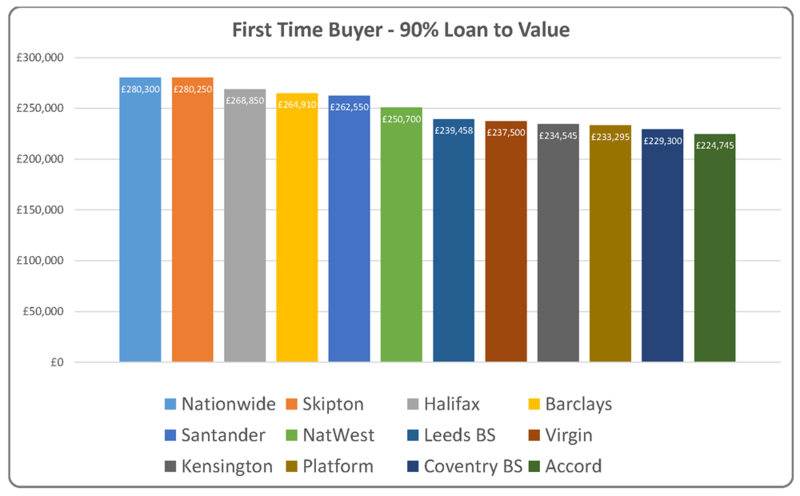 In this example we have joint first-time buyers at 90% loan to value with no dependants. Incomes are £28,000 for one partner, whilst the other receives £25,000 plus a £500 per month car allowance. There are some student loans and credit card debts. 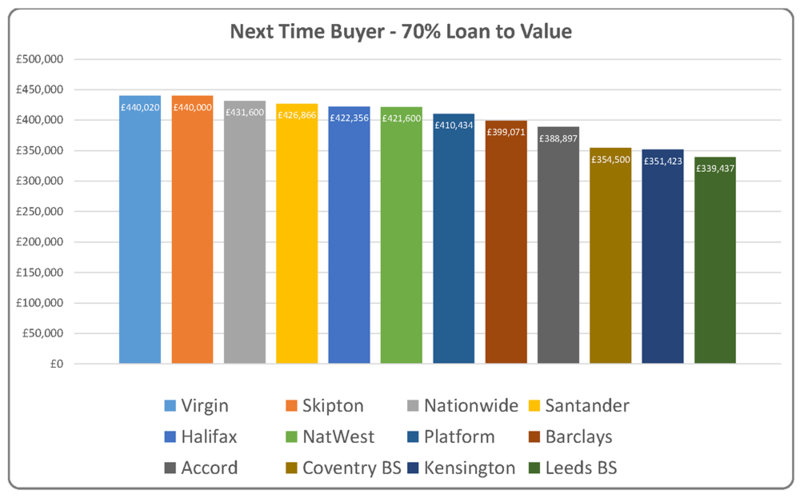 Nationwide and Skipton Building Societies appear to be the most generous lenders for these applicants. However, it would not take much for this to not be the case. For example childcare costs or self-employment may make an alternate mortgage lender a more prudent option. In this example we have joint home movers at 70% loan to value with two dependent children. Incomes are £55,000 for one partner with a £500 per month car allowance, the other earns £45,000. There is no debt other than the mortgage. Mortgage lenders have not calculated maximum mortgage lending from multiples of income for a number of years. Changes to regulation in the UK mean that when arranging residential mortgage applications the mortgage lender must take prescribed steps to ensure that the mortgage is affordable to the applicants. Whilst this legislation does give the mortgage lender some room to make their own decisions on what to include discount and how to calculate, the result is that an income multiple is insufficient in itself. Lenders will generally use an income multiple to cap lending even after an affordability calculation has been made. For example on a help to buy mortgage income will be capped at a multiple of 4.5. This is not the case, and every applicant needs to be looked at on an individual basis for maximum result. For example some lenders are less generous on affordability with the self-employed than they are with employed applicants. Affordability can afford to be more generous for the higher earner as basic living costs form a smaller proportion of the total net income. Some lenders will exclude some of the above in their affordability calculation which can be of benefit to the borrower. Most lenders will exclude any of the above items that will not be continuing when the new mortgage is in place. Other lenders will factor in the above even when they are being repaid. Mortgage lenders are interested in what you spend on day to day living and ask will you to complete a budget planner. If you are unusually extravagant in these areas you may find that it impacts on your maximum mortgage lending. If you are unusually frugal this will probably not assist with your maximum lending as your mortgage lender will tend to set a minimum level of living cost for your affordability calculation regardless of your inputs. This figure is normally based on data from the (ONS) Office of National statistics. Most mortgage lenders online affordability calculators calculate accurately and are the same calculators used by their in-house team when assessing a mortgage application. However the old rule of rubbish in / rubbish out applies. If you are not familiar with the lenders online calculator you are likely to enter the information incorrectly giving yourself a false result. Therefore for an accurate assessment of your maximum mortgage borrowing you should consult your mortgage broker. Credit scoring can and does affect maximum mortgage lending with many lenders. This is particularly the case in the bad credit mortgage market, where an applicant with a bad credit history will be offered maximum lending based on the assessed risks to the lender.